We understand how challenging caring for someone at home with dementia can be for a family. It requires nonstop care both physically and emotionally, which can make it difficult for caregivers to find time to tend to their own health and well-being. Join us for an evening of inspiration and hope as a panel of caregivers shares their personal stories. 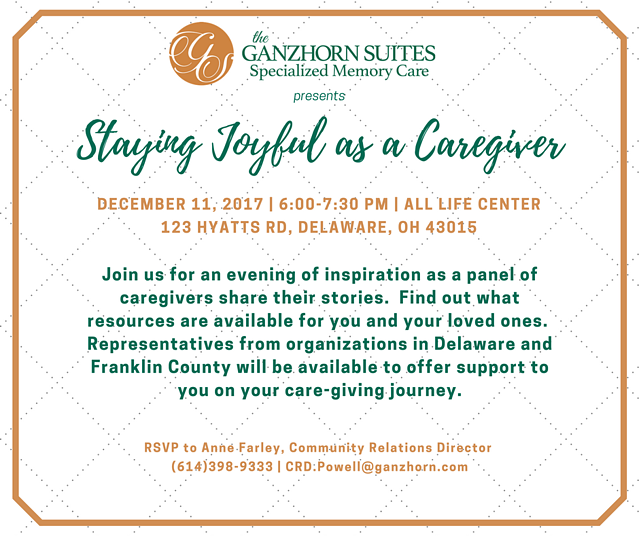 A variety of organizations will be on hand to share information about resources and support services available to caregivers in Franklin and Delaware counties. To RSVP, contact Anne Farley, Community Relations Director, at 614-398-9333 or via email at CRD.Powell@ganzhorn.com.